For the interfaith climate movement in Massachusetts, this is a day for lament, gratitude, hope, and praise. It’s official: Massachusetts Interfaith Coalition for Climate Action – MAICCA, for short – is suspending operations, at least for now. The news went public yesterday. After a nearly three-year run, our Leadership Team concluded, after careful reflection, conversation, and prayer, to suspend future activities of MAICCA for the time being. …(O)ur nation’s political and spiritual landscape changed profoundly in 2017. Navigating the storms has been a struggle, especially for immigrants, low-income communities, racial and gender minorities, the historically under-served, and those most vulnerable to environmental threats and climate change. To our dismay, we have watched the White House and Congress rapidly dismantling environmental protections and policies that safeguard clean air and water, public health, wilderness, and a habitable planet. In this tumultuous time, Pope Francis’ call to hear the “cry of the earth and the cry of the poor” has grown ever more urgent, and MAICCA has wrestled with how best to respond. 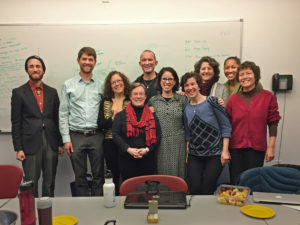 The members of our leadership team have sought to discern how each of us is called to engage in the work of climate justice in this unique and difficult period of history. We still believe fervently that religious and spiritual communities and collective faithful action have a critical role to play in responding to the climate crisis and helping build a just and livable future for our planet and its inhabitants. At the same time, our leadership team has concluded that we as individuals and as a community are in a different place than we were when we gave rise to MAICCA, and that for the time being, MAICCA may no longer be the best venue for our shared work. We have decided to suspend plans for future MAICCA campaigns and programs. For now, MAICCA is on hiatus. In acknowledging that this particular chapter of MAICCA’s existence has come to an end, we hope to open the way for new partnerships and coalitions to emerge. You may have shared in spirited prayer and singing with nearly 600 people at “Answering the Call,” our launch event in Wellesley in October 2015. 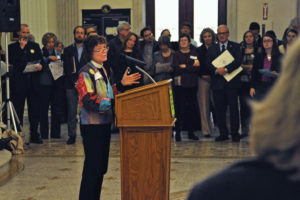 Less than a month later, you may have joined our Legislative Action Day, rallying on the Grand Staircase at the State House and meeting with your legislators to push for a clean and just energy future. Maybe you joined us in Boston for the “Jobs, Justice, and Climate” march and rally in December 2015, the biggest climate rally in the city’s history. Maybe you walked and prayed with us in West Roxbury in May 2016, when clergy and people of many faiths were arrested in acts of civil disobedience to protest construction of the fracked gas pipeline. Maybe you prayed with us at our interfaith gathering before the People’s Climate Movement March in Boston this past April, or participated in the Climate Justice Simulation in Jamaica Plain in May. Maybe you connected with MAICCA at one of our educational events, joined a delegation at one of MAICCA’s waves of meetings with local legislators, or read our newsletter. 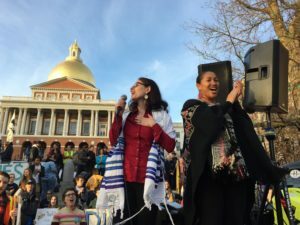 However you engaged with MAICCA, thank you for adding your voice to the growing, multi-faith movement in Massachusetts to call for solutions to the climate crisis that are rooted in racial, social, and economic justice. We believe that interfaith climate action is unique and vital to this moment and to the environmental movement. Engage in powerful faith-framed climate activism as a way of responding to the climate crisis and of transforming ourselves, our communities, and our world. We partner with other organizations and grow a diverse base to build power and implement campaigns to work for legislative & infrastructure progress in Massachusetts. We participate/lead marches and other public actions for climate justice, winnable or not. We bring prayer, art, song, silent witness, and bold direct action to these moments. We use congregations as the nodes of organizing, looking for those inspired to act and be transformed by their activism. We trust that when small groups of people take principled action, others will be inspired to join. Because faith calls and compels us to act, our actions are not dependent on success, but on doing the work. We affirm the dignity of all human beings, and recognize the intersections between climate, the climate crises, and systems that uphold social, racial, and economic injustice. We lift up a prophetic voice that puts forth a vision for climate justice beyond what is currently politically feasible. We intentionally come to our activism as a mode of transforming ourselves as well as the world. We lead from love, not fear or anger. We do not shy from holding the grief of confronting this moment. We each go deep into our own individual religious/spiritual traditions, through ritual and study, in order to mine the wisdom, guidance, inspiration, resilience, and lessons that we need as activists. We come together across religious/spiritual traditions and cultures to learn from each other and be strengthened and nourished by each other’s traditions. We enliven our traditions and we transform our spiritual and/or religious lives by enacting our faith through our activism. Amy Benjamin tells me that the “three critical components” cited above were inspired by the work of Sid Schwartz and the New Paradigm Spiritual Communities Initiative, introduced to her by Rabbi David Jaffe and other leaders of “Kehillot” (covenantal communities) at a 2016 retreat, and now renamed: Kenissa: Communities of Meaning Network. I hope that these three elements – actively contributing to the world’s justice, peace, and beauty; serving a sacred purpose; and drawing from the deep wisdom of our spiritual traditions – will inform and guide interfaith climate justice work in the years ahead. I consider this vision of interfaith climate action – so charged with hope – to be a vision worthy of our trust. The vision is coming to us from the future: we can see it up ahead, we are aiming for it, and it draws us forward. In the end, MAICCA was not the vehicle to fully implement this vision, but we dare to believe that we played a part in creating the conditions that will eventually bring that vision into reality. We give thanks for the Spirit that led us to form MAICCA. We trust that the same Spirit is guiding us now as MAICCA’s present incarnation comes to an end. We look forward with joy to seeing how the Spirit will guide us in the years ahead. In this precarious and turbulent time, how does MAICCA’s stepping back invite you to step forward? How is the Spirit speaking to you? We hope that you, our friends and allies, will amplify and build on the climate justice work already being carried out within your faith tradition and that you will bring your unique gifts and leadership potential to the climate movement. We will be standing beside you!